Love the look and feel of solid wood but want a desk that's more sustainable? 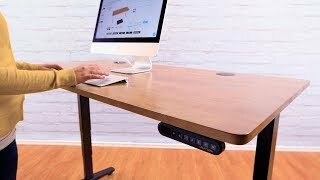 Rubberwood Solid Wood Desktops by UPLIFT Desk are perfect standing desk frame toppers when you want a workstation that blends the best in eco-friendliness and beauty. You might first notice the genuine rubberwood's light blond appearance and muted wood grain characteristics, which complements a variety of office styles - from contemporary to rustic. Hardened over a 30 year lifespan, this lumber boasts a dense and durable constitution, so you'll be able to build the height adjustable workstation you've always wanted, without worries about warping or breaking. Enjoy more a more ergonomic and environmentally friendly desk with a Rubberwood Solid Wood Desktop by UPLIFT Desk. Just pair with one of our reliable UPLIFT sit-stand desk frames to keep you working in healthier postures for you. The UPLIFT Rubberwood Desktop is available in three colors - natural, dark brown, and light brown. The natural finish is a lighter blonde color with muted wood grain characteristics. Dark brown is striking and features chocolate tones. The light brown finish falls in between the finishes and boasts a subtle wood grain. This eco-friendly desktop is constructed using Rubberwood lumber sourced from retired Hevea brasiliensis trees. This material offers a very dense surface, perfect for a durable desktop. Rubberwood desktops are 30" deep and available in the following widths: 48", 60", 72", or 80" wide. Each desktop is 13/16" thick, and won't warp or break thanks to Rubberwood's dense characteristics. Our desktops come standard with pre-drilled grommet holes, but you may choose to forgo grommet holes if you don't want through-desk cable management. Grommets are located fifteen inches from the center of the desk, to the left and right. We've found that this allows for the best combination of cable management and accessory use. Grommet holes allow for easy wire management or you can choose to add power grommets below for an in-desk power solution. $314.00 List Price: $429.00* The list price is the same as the MSRP (Manufacturer's Suggested Retail Price). It may not necessarily be the price at which the product is sold.